When the Protestant Reformation swept over Europe, the little town of Siluva in Lithuania saw their Catholic lands seized and the Lutheran faith dominated in 1532. By 1551 that gave way to Calvinism, and the Catholic following died out over the following decades. So, when Mary appeared in 1608, it was in a completely un-Catholic atmosphere. One summer day in 1608, a number of children were tending their sheep in a field on the outskirts of the village of Siluva. They were playing near a large rock, close to a wooded section of the field, shouting merrily to one another in carefree fun. Suddenly, one after another stood transfixed, staring in the direction of the rock. In the silence there could be heard the sound of loud sobbing. Then the children beheld a beautiful young woman standing on the rock holding a baby in her arms and weeping bitterly. Her overwhelming grief was only too evident. She did not speak, but looked at them sadly as she stood there, weeping as though her heart was breaking. So profuse were her tears that they ran down her cheeks, and some of them splashed on the rock. The woman was dressed in flowing blue and white robes, unlike any costume with which the children were familiar. Her long, light brown hair fell softly over her shoulders. A strange light surrounded both the woman and child. When the children went home that evening, they told their parents and neighbors about the weeping woman. 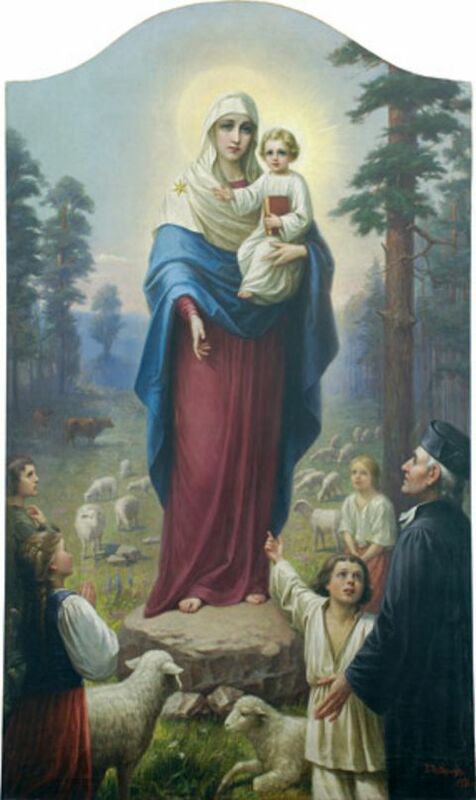 A group of curious people are stunned by the appearance of the Virgin Mary. 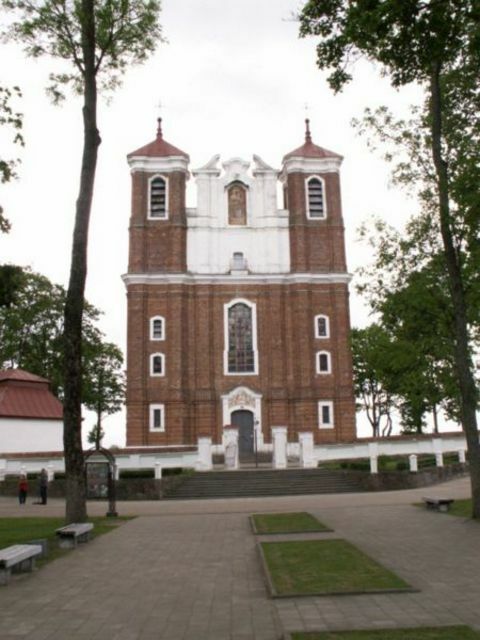 The basilica in Siluva, Lithuania. Then she disappeared in front of everyone present. They were confused, dumbfounded, and stunned. They did not really believe that it was the work of the devil as the Calvinists had insisted. A blind man, more than a hundred years old, heard about the apparitions from a nearby village. He recalled a night, eighty years ago, that he helped Father Holubka bury an ironclad chest, filled with church treasures, next to a large rock. The villagers led the blind man to the field where Mary had appeared to see if he might be able to locate the place where the treasures had been buried. No sooner had he reached the spot, when his sight was miraculously restored. Falling to his knees with joy and gratitude, he pointed to the exact spot where the chest had been buried. The ironclad chest was dug out of the ground, and when it was opened, there – perfectly preserved – was the large painting of the Madonna and Child, several gold chalices, vestments, church deeds, and other documents. The painting was enshrined in the Basilica of the Birth of the Blessed Virgin Mary. Many miracles have been recorded over the years. The apparition was authenticated by a Papal Decree by Pope Pius VI on August 17, 1775.